Lindy was an extremely short-lived comic, despite the “great launch” the special says she had. 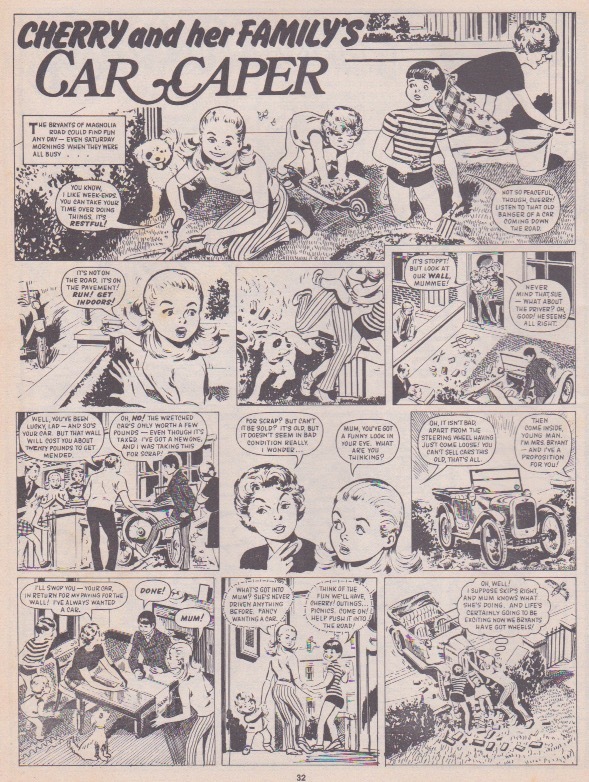 She lasted only 20 issues before becoming the first comic to merge with Jinty in 1975. So this is most likely to be the only summer special Lindy produced. It looks like the special came out while Lindy was still running because there is an ad urging you to buy Lindy on page 33. Moreover, the editor’s comments on the inside front cover describe the regular comic as “brand new”, and also that it had a “great launch”. But there is no sign of a cover girl called Lindy; it is photographs of people that accompany the comments. Only the signature at the end says “Lindy”. 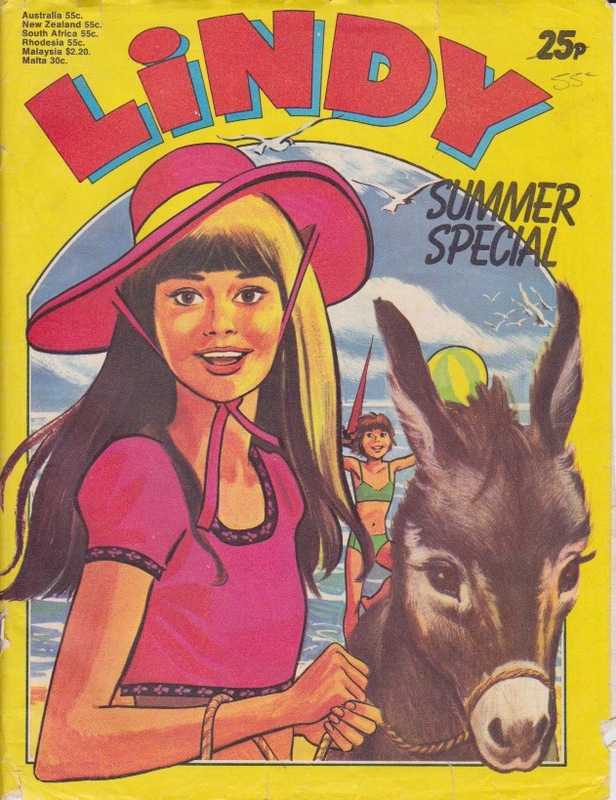 Clearly, Lindy never had a cover girl, unlike Tammy, Jinty (to some extent) or Penny. My copy regrettably has some missing pages, but at least there is a contents page to fill some gaps. The missing pages are 39-42, so if anyone can provide scans I will be grateful. The cover certainly is colourful and beautiful. The use of yellow background and pinks and blues in the picture are very eye-catching. The only regular characters Lindy had were “Hard Days for Hilda” and Penny Crayon, which appear here as well. Hilda Hobbs works cheerfully at the hotel where she works, despite the abuse from senior staff. 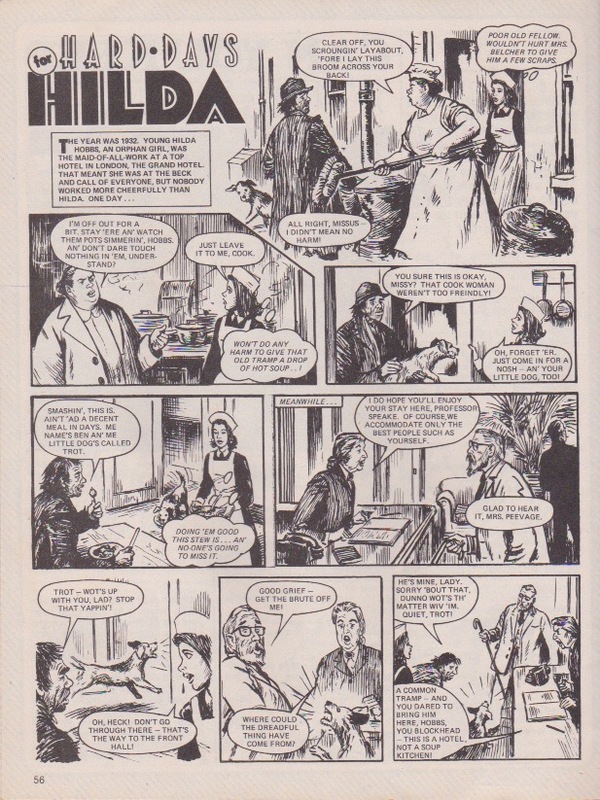 Here the mean cook begrudges a tramp a square meal and blasts Hilda when she tries to do so. But of course there is a complete turnabout in the end: the cook is forced to give the tramp a free meal as a reward when he unmasks a thief disguised as a professor. It is a pity there were not more regulars to give more Lindy flavour to the special. It is hard to say which stories were written for Lindy and which were reprinted from elsewhere, or whether they are all reprints. 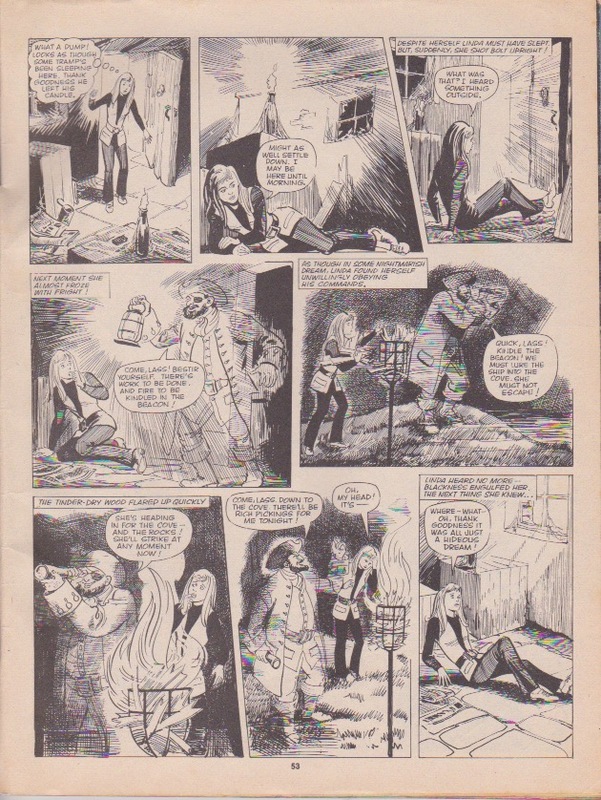 Reprint is certainly the case with “The Millionaire Dog”, as Jesus’ Redondo art looks like it came from his early days and is not up to the level of development seen in his artwork for the regular comic. Perhaps it came from June. And the Tom Hurst artwork in “Diana’s Dolphins” looks like it might be some of his earlier work too. There are some gems in the stories. In “Diana’s Dolphins”, the Dobson family run a dolphinarium, but Dad doesn’t want the girls to find this out when he sends Diana to a posh school, in case they look down on her. But Diana’s swimming skills from her dolphinarium experiences put the school on the map for swimming and Dad finds he had nothing to worry about. In “Dragonacre”, the environment of Dragonacre is threatened when a Mr Barker wants to buy it for development. To save it, Kerry Ward and her friends have to find £2000. It is then that they discover that the legend of real dragons at Dragonacre was not just a legend. And in “Milk-Round Maggie”, Maggie Marvin wins the title of Milk-Round Miss and treats her friends at Paradise Place to a day at the seaside. A yob called Crispin threatens to ruin things with his thoughtless behaviour and disregard for others. But of course it all ends up a smashing holiday – except for Crispin. And in “Jumping Jenny”, new girl Jenny gets off to a bad start at her new school when she is wrongly branded a sneak and sent to Coventry. A teacher discovers her talent for hurdling when she tries to run away, but how can she even get into the team while she is in Coventry? Addendum: I have found that the special came out on 3 July 1975 while Lindy was only on her third issue. Penny’s Super Summer Circus Dice Game! 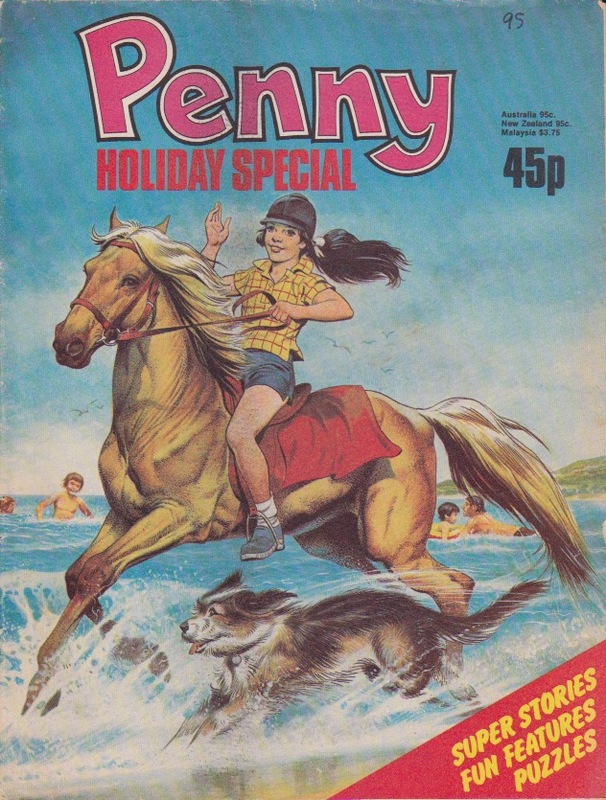 Recently I have come into possession of this Penny holiday special and there is nowhere to discuss it except on the blog of the comic it merged into. As this is a holiday special, it is not surprising that many of the stories focus on holidays, including the regulars in the comic: Sad Sal and Smiley Sue, Tansy of Jubilee Street, and Snoopa. 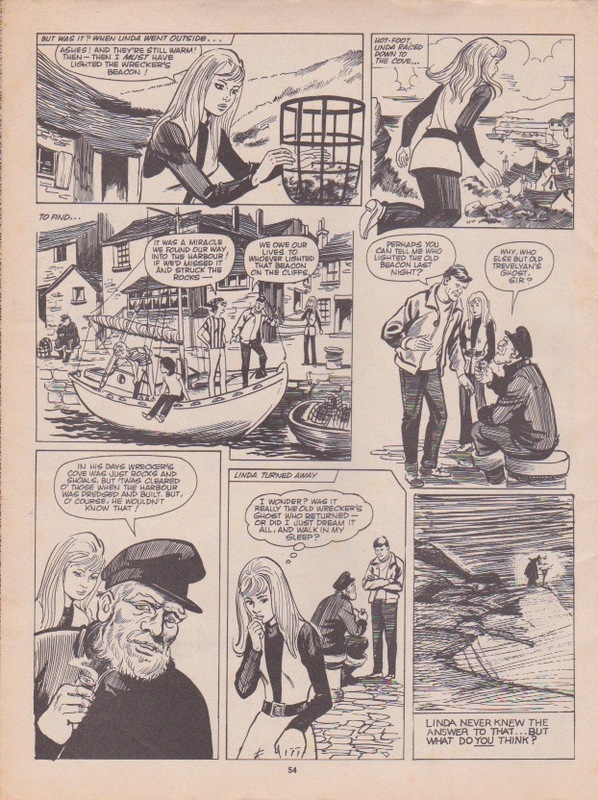 Tansy is drawn by Robert MacGillivray this time (I leave a page of it here for you to draw your verdict on his Tansy), but all her other regulars have their usual artists. Penny also has a collection of reprints (probably from June), which also have holiday themes. Several of them are connected with boating and seaside, such as “Will of the Birds” and “Wrecker’s Cove”. “Wrecker’s Cove” is clearly reprinted from Strange Stories, except that the Storyteller himself has been deleted and replaced with text, and the panels where he should be look like they have been drawn in additionally as the hatching looks more coarse and crude than it does in the rest of the story. The story itself I found a delight – the joke is on an old wrecker! I have reproduced the story here as I wanted to take a scan of it anyway. There is also a reprint from June’s “Cherry”. 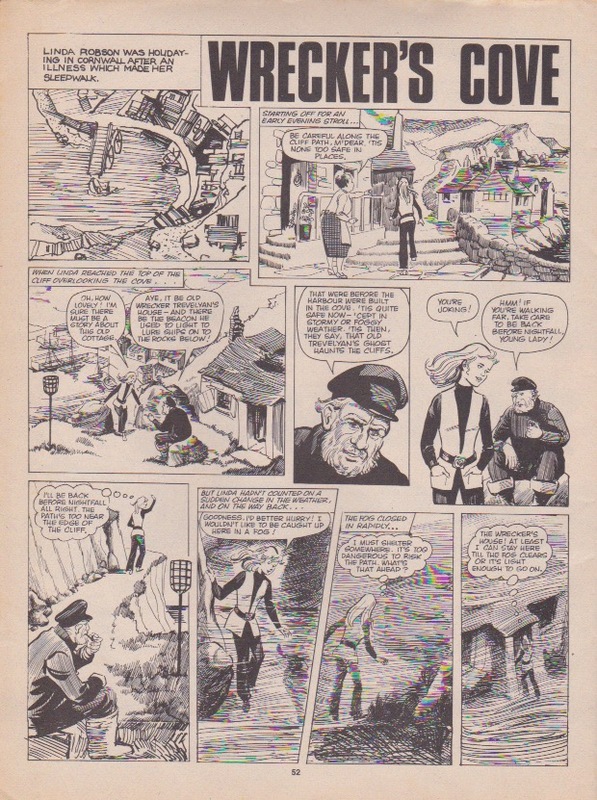 As the story is drawn by John Armstrong, it carries over nicely from his artwork on the Enid Blyton adaptations in the regular comic. I wonder if that was what the editor was thinking? In the story, Mum buys a vintage car so she can learn to drive (what a model to start driving in!). Naturally this leads to all sorts of scrapes, including the one Mum is accused of doing to another car. Cherry and her family have to turn detective once they realise another vehicle was responsible. 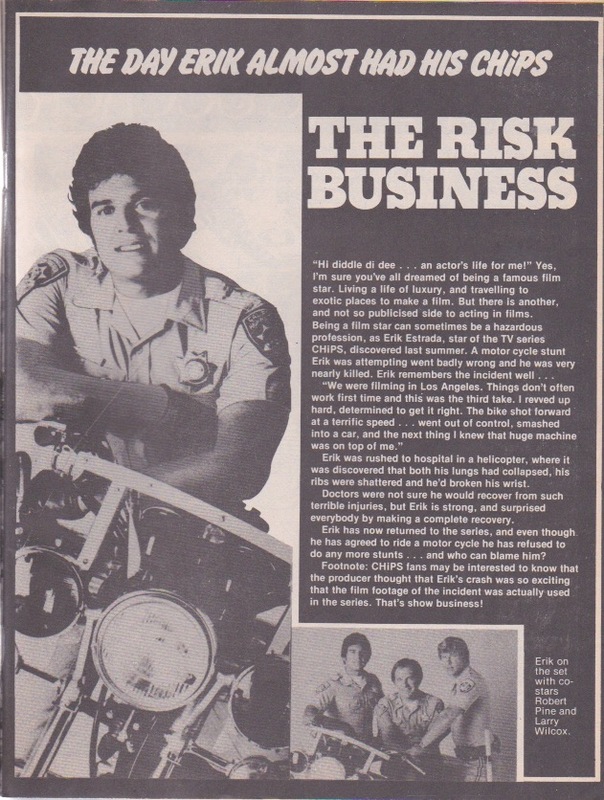 And the feature, on Erik Estrada of “Chips” shows that life imitates art. Estrada suffers a serious accident on the set – and they use his accident in the footage for the show! This is a pretty solid holiday special. The stories and features will make readers want to read it again and again. It is not quite aimed at the younger readership of the regular comic and seems to be more for a mainstream audience that makes up the readership of Tammy and Jinty. But Penny readers would have enjoyed it all the same.